I've been feeling uninspired by the cereals offered at my supermarket, and can never be arsed going to the bakery in the morning, so I recently rustled up some of my own brekfast treats. I made blueberry muffins (recipe from Nigella's How to be a Domestic Goddess, to use up half a carton of buttermilk and these frozen high-antioxidant berries that I bought for my short-lived detox. 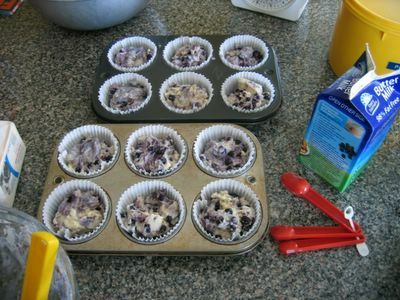 They're very simple to make, as it's just a case of mixing dry ingredients into wet ingredients, and then baking. As always, the main point to be careful of is not to mix the batter too vigorously, as that will overwork the mixture and make it tough. Lumps are good! A couple of days ago, I also made a big batch of Andy's Fairfield Granola (Nigella's recipe again, from Feast). This one is definitely a family favourite, and I've lost count of the number of times I've made this one. Even though there's a long list of ingredients, it's easy to make as well - just stir everything together and then bake. As it cooks, its cinnamon-scented warmth makes your home smell just how a home should. At the same time, I whipped up some rhubarb compote (Feast), because rhubarb was on special, and it just looked so nice and red. And seeing as bananas are so expensive these days, I need something to go on my cereal! 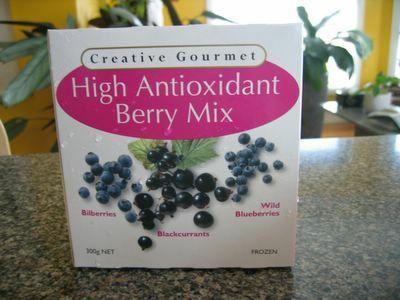 I just love blueberries... Great in anything from muffins to pies or just plain. 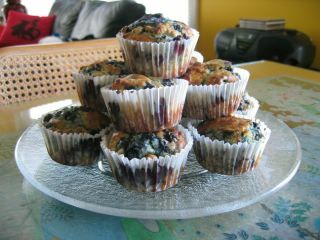 The muffins look great! I am growing three blueberry bushes in my backyard, but I only got a couple this year. 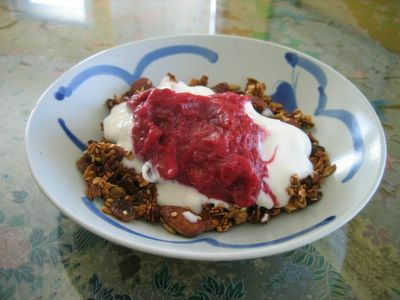 I love that granola, and I also eat it with yoghurt and stewed rhubarb! It's the perfect combination. Did you go to Rome or Florence in your travels? Belinda and I would love to hear of any recommendations! We're taking off in about 2 weeks, and are getting VERY excited! I was reading over on egullet how expensive bananas are, like 16-20kg. That is ridiculous. We pay 33cents a lb here, I hope they go down in price for you. Niki - I did go to Rome - we didn't do a lot of restaurant eating, but I'll be blogging about it soon!